(CA.ARA) – If you’re like most people, you probably like to update your décor about every five years, according to interior designer and author Mary Gilliatt. “It’s good to make a five-year plan. I think things need refreshing,” she says. But when it’s time to revitalize your decorating theme, what comes to mind? A new paint color for the walls? New window treatments? Perhaps some new accessories or different throw pillows for the couch? How about a new floor? Material cost, installation, and the potential for sub-floor alterations together often conspire to prevent consumers from considering the floor as an option when updating the décor of a room. “Floor buyers, regardless of whether they’re interested in vinyl, ceramic, wood or carpet, can suffer an extreme level of anxiety because floors are typically viewed as a permanent or semi-permanent investment,” says Chip Braulick, vice president, marketing, Tarkett Residential. However, there are flooring options that need not break the bank or require professional installation. More versatile, cost-effective flooring can evolve with the personality of the room, and in some cases even serve as the design anchor. One such option is FiberFloor, from Tarkett. FiberFloor uses innovative technology to combine the benefits of vinyl flooring, laminate flooring and carpet to deliver a product that is easy to install, easy to clean, offers numerous design options and is cushiony and warm underfoot. FiberFloor consists of an engineered fiberglass interlayer between two vinyl layers with a comfort backing. The fiberglass interlayer and comfort backing make it more flexible and bendable. It also provides stability so the flooring will not expand, contract, crack or curl. The comfort backing serves as a base for indentation resistance and reduces impact noise and sound transmission. The advanced fiberglass technology is engineered to lay flat and stay flat, facilitating FiberFloor’s unique glueless installation. Consumers literally only need to measure the room, cut the product and lay it in. “Changing your flooring can give your room a completely different look and feel,” says Jane Parr-Whitehead, an interior designer in South Florida. “Among my clients, about one-third of them are ready to rip up their carpet or tile, but most feel they just have to work around what they have because of the expense.” FiberFloor gives homeowners the freedom to change their floor without breaking the bank. Gilliat advises people to develop their own style in their home decorating, just as they would in clothes. FiberFloor’s first collection, Personal Expressions, showcases distinct decorating choices for every room in the home, offering looks that replicate everything from ceramic tile and wood to leather and sisal. The broad variety of options enables consumers to choose flooring suited to their own personal styles. The “Dare to Dream” collection, specifically developed for the youth set, includes whimsical and fashionable designs that adapt perfectly to the changing décor of children’s rooms. Parents might consider the glow-in-the-dark starry night pattern, Blue Heaven, for the nursery or a toddler’s room. A six-year-old might be more interested in the chalkboard pattern called “Graffito Night Train,” another glow-in-the-dark design that replicates drawings on a chalkboard. Other metallic patterns like “Matrix Harvest Sunset” deliver a sleek, contemporary finish that would appeal to an older child or teenager. 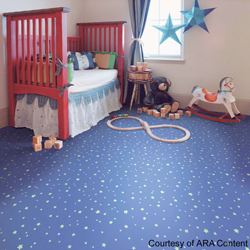 The unique construction of FiberFloor allows the consumer to change the décor of a child’s room as they grow, simply by changing the floor. The three other groupings, “Sunday Morning Jazz,” “Wood is Good,” and “Back to Nature” offer more traditional and sophisticated designs that are appropriate for a variety of rooms and tastes. Wood and slate/stone looks help create a more upscale, indulgent living space. Textured patterns bring an elegant, classic feel to residential settings, while natural looks offer comfort and warmth.